I've many time recognized that I haven't really understood the order MPS applies the rules of a template. That is why my generators now consists of many templates with sophisticated priorities. A root node a of concept A should be transformed to a node b of B. But root node a should be kept in the model. There will be just one node of A in each model. For each node c of C, which is no descendant of a, one node d should be generated to the subtree of b. Each node of concept C should be transformed to a node of E.
Is there any way to implement this with just one mapping template without any scripts? I've added a sample project which implements this example. The generator fails in this version. Perhaps someone can provide a patch for it. When you are mapping an input node to an output node, you have to provide the input node to query the output node using a label, even if there is only one possible output node. That means, you have to use get output by label and input instead of get output by label. Damn, that was easy! Thanks a lot! What is the meaning of this? Should I just weave new nodes inside the same root node? How can I get rid of this message? To support parallel and incremental generation, MPS does not allow to use a different root as the weaving target. 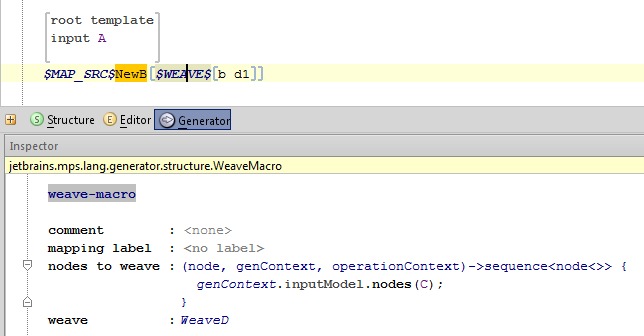 You can use a $WEAVE$ macro in the template of the target instead. I forget about the weave macro again. There is no documentation about it, isn't it? Where should I use it? In a reduction rule? And how can I define the context node. Perhaps you can tell me for the example. The weave macro works the other way around. You attach it to the context node and define the source nodes. The weaving template is the same. Thank you very much! Now I've got it and I've seen that many of my recent generator templates are too complex! But information about this macro should really be added to the user guide! For me it seems that it is more meaningful than the weaving rule.